The Ultra Brasil Brand has just announced the Phase One lineup for the inaugural edition of Ultra Brasil. 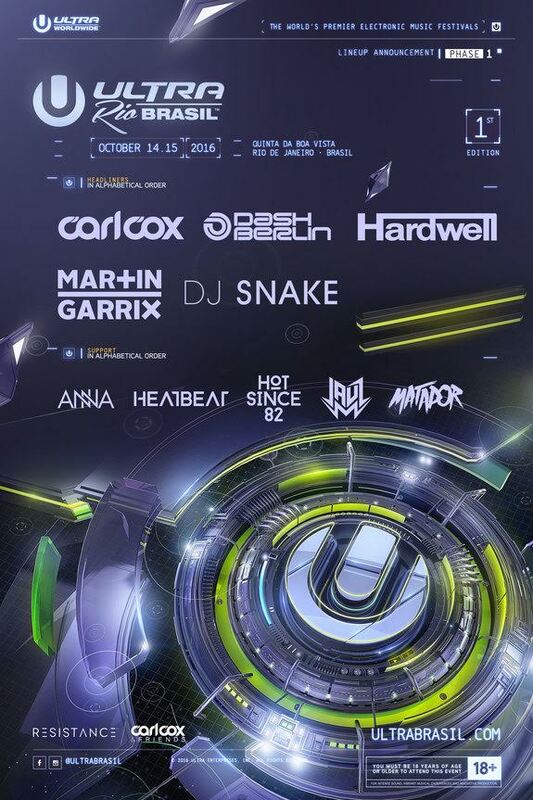 Taking place on October 14 & 15, 2016 in Rio de Janeiro, Ultra Brasil is bringing big artists to their roster like Dash Berlin, Hardwell, DJ Snake, Carl Cox, andMartin Garrix. Other notable support names include Anna, Heatbeat, Hot Since 82, Jauz, and Matador. Due to an overwhelming demand for tickets, Ultra Brasil recently announced that it will be moving to the beautiful, centrally located Quinta da Boa Vista Park. Ultra Brasil will mark the final stop on its massive South American tour, crossing through Peru, Chile, Bolivia, and Paraguay in just one week. Tier 1 and Tier 2 tickets sold out shortly after becoming available earlier this year. Limited Tier 3 tickets are now on sale.